Editor’s Note: This review was originally published in 2008. Since that time, Picnik has shut down. They official ended their service in April 2012. They moved many of their tools to the Google Plus Platform. This review has been archived and left up for informational purposes. 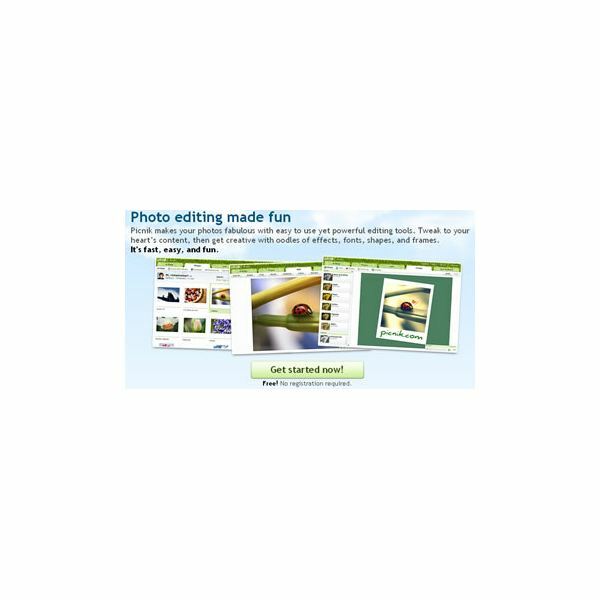 Picnik is an online photo editing program that is free to use. You simply go to the Picnik website and edit your photos from there. You don’t even need to register to use this program. With Picnik you can edit photos, crop photos, add text to photos, and more. To use Picnik, all you need is an internet connection. To load the editor you will need to click the Get Started button. I was very excited about trying Picnik until I hit that button. Unfortunately, I’m still on dial up, haven’t yet upgraded. The editor took a good 15 minutes to load on my computer. So, that was not good. I was getting tired of waiting. I have no clue how long it takes on a higher connection. So, if you are using dial up, prepare to wait a while. Although it isn’t necessary to register with Picnik, the option is there (and free). Registering will allow you to store your photos on the Picnik website. You can upload photos from your computer or from social networking sites, such as Flickr, Facebook or Photobucket. Clicking on a website’s icon will automatically connect your Picnik account with the selected website. For example, if you click on the Flickr icon, Picnik will connect to your Flickr account, which will then enable you to open, edit and save your images within Picnik. The edit section allows you to adjust the color of the photo, resize the photo, rotate the photo, crop the photo, and remove red eye. The editor is very easy to use. You will see the buttons below the Edit tab, clicking those buttons will allow you to easily edit your photos. I give the editing section of Picnik 5 stars. After you have edited your photos, you can click the Create tab or you can skip the editing and go straight to the Create tab. In the Create section of Picnik, you will be overwhelmed at first glance. There is so much to do in the create section. At the top of the photo you will see the different options for creating the photo. The first option is the effects option and it is already selected. So, down the left side of the browser you will see the effects that you can apply to your photo. Click an effect, make adjustments and click Apply. You can add text to your photos by clicking the text tab. Again, your options will be on the left of the browser. You can also add shapes and frames to your photos. These can be easily added by clicking the tabs above the photo. You will see all the changes to your photo right in your browser. The Picnik editor is free to use. Overall, I give it five stars. It is a great way to edit photos and you don’t have to install software to use it. It is also great for editing photos for social networking sites because you can open it from the site and then save it back to the site. Click here to visit the Picnik site.